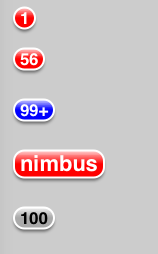 This Nimbus badge view is a UIView that draws a customizable notification badge-like view. The badge view works much like UILabel. Once you've assigned text and configured the attributes you should call sizeToFit to have the badge determine its ideal size.